Our Dual Focus Monocular Telescope Comes With A Lifetime Guarantee and Money Back Guarantee ! Multi-layer composite green film has good light transmission rate and it can make the image very bright and sharp. Handwheel can increase the friction that makes focusing more comfortable and convenient. Adjustable eye-cups and sufficient eye relief make viewing a true pleasure. 2. Do not allow using the monocular to watch the Sun directly! Use the monocular to watch the sun will causing incurable injure to human eyes. If you are unhappy with any product, please do not hesitate to contact us. EAGWELL will provide you with the best shopping experience ! Night Vision Mulit - coated optics upgraded version of the green. Low light night vision built-in design. Night reflective with a clear vision. Dual Focus - Eyepiece focus and Lens focus, Dual focus function ensures excellent optical transmission and brightness. 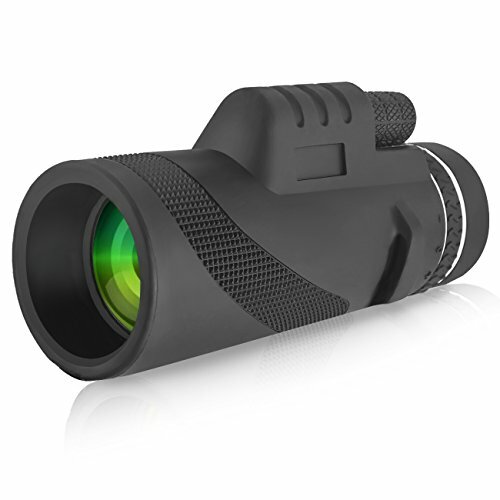 40x60 Zoom Monocular - See things 40 times closer; Get clearer and brighter vision with 60mm objective lens. Field of view: 500M/ 9500M. Waterproof and Shockproof - Built in Lens Dust Cover can prevent lens from dust and make sure you see everything in a clear detail. So Eagwell Dual Focus Monocular Telescope great for any weather and any environment. COMPACT & EASY TO CARRY - Size: 150 x 60 mm/5.9*2.4 in. Easy to carry in the pocket, backpack or bag anytime, anywhere. Suitable for scope, camping, hiking, fishing, bird watching, wildlife and concerts.